My first card is a little bit spooky with the cat and rickety fence silhouette. Fun to do a colorful Halloween card for a change:) The colors are kind of crazy, but I like the thought of a storm brewing on All Hallow's Eve! If you would like a chance to win your own Reverse Confetti goodies, just leave a comment on each stop along the way for a chance to win a $15 gift certificate! Comments are open until Thursday, October 10th at 2pm CST, and the winner will be announced on the Week in Reverse post on the 11th over on the Reverse Confetti blog! soooo fabulous. looooove that cloudy night sky you created and the cat on the fence is awesome. Adorable candy corn card. I'm a sucker for shape cards. shaking my head...you are a super star! I always love your creations! Ooooooo, JJ!!! That cat card is JUST FAB!!! LOVE those colors! And how cute is that candy corn?! Too stinkin' cute...love all the colored clouds. And the candy corn card...adorable!!! What fun Halloween creations! love the colorful sky on the first - and I'm sure the kids will love the cute candy dorn shaped cards! Love your gorgeous background on the first card. The candy corn card is sweet as can be. Amazing Halloween creations; perfect showcase of RC products! Time to move the 'wish' list to the shop list! Thanks for the inspiration! wonderful job on the color layering in the clouds. 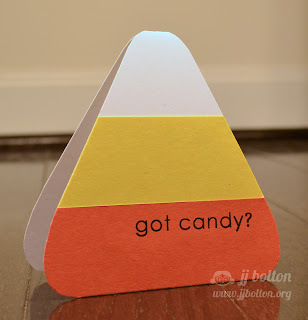 i also just adore the candy corn card - so simple yet so cute!! Fabulous cloudy background - the candy corn card is pure FUN! Love both of these cards but the silhouette cat and fence card has to be my fave. I am SO into silhouettes right now. TFS! Both cards are so fun...such a nice Aunty! Your sentiment on the candy corn rocks! What an awesome card. Love the colors and the impending storm! I love all of your fluffy, colorful clouds with the silhouette images on your first card, JJ...so fun! Your mini card is so sweet, too...I love how it mimics candy corn, and I know your nieces are going to love it, too! Such clever creations, as always...thanks for sharing them with us! Ok, my jaw is sitting in my lap from gazing at that first card! Stunning!! And how stinkin' cute is that candy corn card! Love them both! Thanks for sharing JJ! OMG the clouds on your card are gorgeous!! Love the background of the first card and the candy corn card is adorable. I adore these projects! The inked background is amazing...and I love the one layer design. Love the sunset on the first and the fun shape on the 2nd. OMGosh beautiful colors! I don't know if I could recreate it or anything close. Absolutely GORGEOUS! The inking on that first one is fantastic, love all the colors and the great silhouette, and the second one is so cute! That stormy sky sure is spooky, I love it!! Wonderful effect! Love the silhouette images against that great sky you created. The candy corn is very cute. That stormy inked sky is amazing!! And the little candy corn is so cute too! I have totally fallen in love with the background on this card! It is such a great take on the classic cat on the fence for Halloween. Amazing inking. Love it!! And your nieces are going to love that card!! Awesome background on the first card! Looks AMAZING! And I'm totally smitten with the candy corn card so cute! Cute cards - love the background and the silhouette look on the first card. Great cards, JJ! That background is perfect with the cat and fence silhouette! <3! Awww, I love the coloring of the sky. Awesome cards JJ, love the sky you created and the cat sitting on the fence is perfection! Great cards! LOVE the colors of the Halloween sky with the cat and fence! And the candy corn card is so fun! These ROCK! 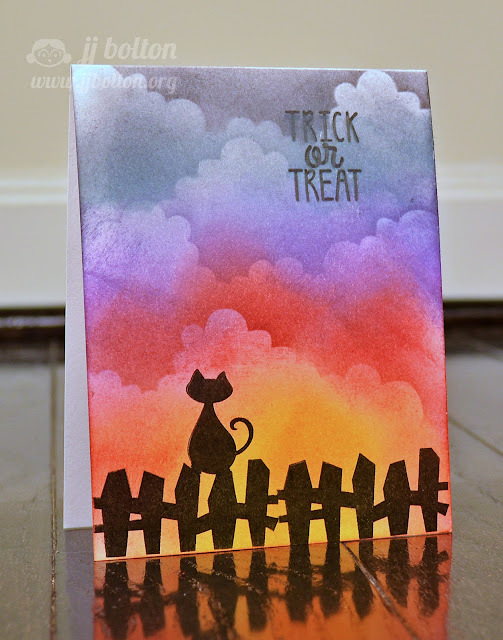 I love the colorful sunset back with the cute little black cat silhouette perked on the fence like that and your candy corn card design is simply precious! Great projects. Love that sky!! Love the candy corn!! Adorable! Are you serious?!?!?!? You are just tooooooo clever, JJ! I love love love these cards! LOVE the background on the first one (and how you've paired the cat and fence together! ACK! ADORABLE!)!!! And I LOVE that you created a little candy corn card! FAB x100000000000 (as always)!!!! !